We are feeling MUCH better at our house. YEAY! Harper has had a really good day today so I'm hoping tonight will be an ever better night of sleep! We got to go to our first MOPS meeting. I've missed the last two because of different reasons so it was fun to go today. We really enjoyed it. Are you in MOPS and do you like it? During Harper's afternoon nap - I decided to do a little re-decorating. I moved our family room coffee table over to a wall. We needed a little floor space where she can get down and play besides her bedroom (our house only has carpet in the bedrooms). Here she is enjoying her snack with Dawson keeping a watchful eye. This afternoon we made a little trip to T J Maxx where I found these precious boots for $7 each. Are they not so cute??? I can't wait for her to start wearing them! We also got this plate today from HERE. I love melamine plates but this is too cute to eat off of so we will display it in her room! HI Kelly, So glad to hear Harper is feeling better. Those ear aches are miserable. The tiny Ugg boots are darling. She will be styling this winter for sure. Love the picture of Dawson watching Harper. You never know when she might drop a goodie. Have a great week end. Hope you have a great weekend! I too have missed my first 2 meetings at MOPS and was able to go today. I think if for nothing else, it's just great to get out and fellowship with other Christian moms that encourage and lift each other up!! It's so great to have that support system around you! 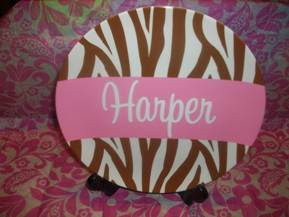 Love the Harper plate and we are watching DVR' shows tonight too!!Enjoy~! all these super cute outfits and adorable hair bows/bands make me want a baby girl real bad!!! I've been a blog stalker for some time. Whenever I thought about leaving a comment it was always a few hundred in... so, I didn't, thinking you may NEVER got to it. I just want you to know that I really enjoy ALL your posts. It's the highlight of my morning while eating my breakfast before work. Harper is so beautiful! I enjoy seeing all her various outfits, and hearing about all she's starting to do. I especially loved the video of her eating and stopping to smile at her daddy between bites. Thank you for all you do in your blog!! ENJOY the night - and the steaks! It does sound like lots of fun!! Hi Kelly!! I LOVE MOPS -- just got back from the MOPS convention in Nashville and am all pumped up for the year ahead. I'm on the committee so I have slightly different perspective, but let me just tell you -- give MOPS a chance --- you will never be sorry you did!! Harper is adorable as usual and your home is beautiful!! LOVE LOVE LOVE your rug!! Just had to say!! LOVE the baby Ugg looking boots, SO SO cute! I would totally get those for my baby too! T.J Maxx is also like one of the best stores yet, I can't go in and not spend hours looking lol :o)! I just love reading your blog each day. I have to make it by TJ Max what a steal! Precious precious precious!!! Please keep me in the loop with MOPS. Ive thought about going. Beautiful living room too. Ok, missy, spill the info about the dress!!! I have to know where I can get one!! So glad she is feeling better!!!! Love the outfit and the boots, but love the girl more! Yum! Steaks sound great. I am in MOPS. I couldn't wait to have a baby so I could join MOPS! Seriously. I have had friends in it for about a decade and I was so anxious to join! Your house is decorated so cutely! Where do you come up with your ideas? The room looks great! And Harper is precious as always. I love your style. My hubby and I are gearing up for our own "stay-in" date night. The girls went to bed at 8:00 and he's out getting us some Mexican takeout. We'll eat, talk, and maybe catch up on the Office, which we missed last night. I love date nights! Enjoy yours! love the boots... and her cute lil dress and headband! she is precious. glad she's feeling a little better. my 8 mo baby boy had a viral throat infection... not fun. i know what you are going thru. i also had a date nite planned of watching tons of shows, but my hubby wanted to go to a football game. so i made him take our 2 yr old! maybe we'll catch up on the shows another nite! Harper gets prettier every day...is that possible to get any prettier?? I love the boots!! I may just have to get some for the twins. We don't have MOPS at our church, we do MUMS (Moms Uplifting Moms Spiritually) and I LOVE it! I love the boots too! A friend of ours had some last winter and used them as socks and shoes for her baby. They were so warm! Might have to make a stop by TJ Maxx tomorrow and see what fun things we can find! well that is exactly what hubby and I are doing tonight. Grilled steaks, baked potatos, and salad! YUM! We are also catching up on some of our DVR'd TV shows. I'm glad for a quiet night at home! Love your blog and am glad to be a follower! Love her dress. Love good bargins. Love date night with hubby! Gotta love that DVR! That is the best way to watch! Harper is the cutest! Have a great weekend! Glad she is feeling better! I hope it continues to go well! Harper is just too precious. If we lived near each other, we'd have to let her and my Benjamin play together. They are only 3 days apart, if I remember correctly. The living room looks beautiful! I love the rug! Loved MOPS when mine were little. Harper is getting cuter everyday if thats even possible! We're having the same Friday night fun here too- TV and dinner together! Love the new look in your living room! I'm so glad Harper is feeling better. A sick baby is no fun at all! Sometimes evenings at home are so much fun! We had one Tuesday night, my mom kept the girls. You just need that one-on-one time together to reconnect and catchup sometimes. I love seeing pictures of Dawson. I think u should show more of him and Harper. Cute rug! Hope u and your hubby have a fun date night. P.S. I was at Walmart and got the $5.00 scarf like u. Now, I just need to know how to wear it. It doesn't look as cute on me as it did on you. HA! Precious plate and I love Harper's dress, too. I have a date with AK's closet this weekend...time to get out fall/winter stuff! Ha Ha Ha how cute are those shows/boots. Just got alex a few pair for winter! 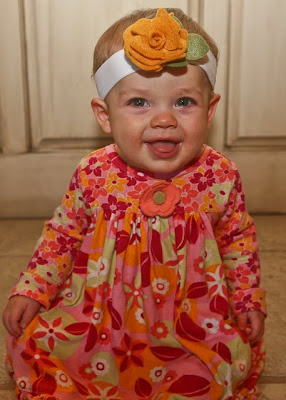 Love her headband and that adorable dress! I'm attending MOPS for the first time this year and I've been loving it! I'm trying to get a playdate started for the Thursdays we don't have MOPS (our MOPS group meets the 2nd and 4th Thurs. of the month). I love getting to chat with other moms and make new friends! Love Harpers outfit, sooo cute! She looks so cute! I love that zebra striped rug it is so cool! I'm having a baby girl in a few weeks and have that same Baby Lulu outift. I'm dying to know where to get that bow/headband Harper is wearing. I was going to email but your email is taken down, so hopefully you can blog about it or something. We had steak for dinner too. Must be steak night! Is that a Baby Lulu dress that Harper has on? Where do you get her's from? Our mailman has to think I'm doing something illegal by the amount of packages I get from all over the US when I buy Bailey's off of ebay. I just wondered if you had a local place you buy for a good deal. i love her dress. she looks adorable. I went to a MOPS group the other day. It was TERRIBLE and very embarrassing. I didn't know that our local group had a waiting list to be involved. So I show up, all proud of myself for stepping out of my box. Okay, she is just too cute. I bet Dawson is hoping she drops lots of snacks! I'm so glad that Harper is feeling better. The boots you got for her are so gosh darn cute...love them. The dress she is wearing is also adorable. Hope you have a great weekend watching college football. I love the little Harper plate! It's so much nicer for a child to have something individual to eat off, rather than just Barbie or Disney or something that everyone else has. That said- I'm a sucker for Bunnykins!- boys and girls can use it- I love the sweet innocent images. I am in MOPS here in Keller, TX and it rocks!!! I love fellowshipping with other christian moms and I LOVE doing the crafts! We also have many great speakers at our meetings! They speak on all things such as how to love your mate, fun activities to do with your kids, play therapy, etc. We also have a short devotion time at the end, I have really enjoyed getting to know lots of moms in my church that way! Glad she's feeling better. I too have a date night with the hubs on the couch to watch recorded shows! Fun!!! I just started my first MOPS groups about a month ago. I'm looking forward to a great year in it! HEy Kelly! Harper is just so darn cute!! THose boots are adorable. I am in a MOPS group and I really enjoy going. I think its good for mommy's to get out & to know that other people are in the same or similar situations! Love the boots, plate, redecorating AND the outfit and of course the cutie wearing it! :) Have a great weekend! Glad y'all are feeling better!! 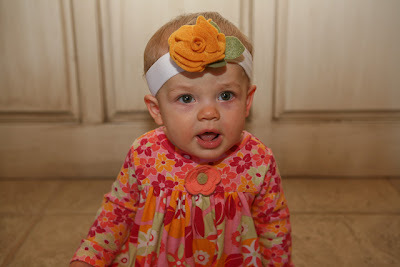 I love harper's flower headband! And those shoes are precious! Hi Kelly - you are going to love MOPS! I am going on my 4th year in a MOPS group. The first group I was in started w/ about 10 and now I am in a different group that's about 45 women! It's a great oppurtunity to make new friends, get advice from other Moms, and know you're not alone in some of the struggles we go through as moms. I know you're going to love it!! I'm not sure if you read all your comments, but I just found your blog, and wanted to say how much your story touched me! My daughter also spent time in NICU after her birth (so many people think only preemies end up there, but my daughter was a 40 weeker too! ), and I know the feeling of not being able to hold your child, of staring blankly at monitors, of listening in to doctors as they make their rounds trying to distinguish some intelligible fragment, and going back and reading your posts really took me back to that place in my life. Even though I just found your blog, I can already tell I'll be following along! Judah and I go to MOPS and we love it! It's amazing that there are thousand of different moms all across the country that are doing the same things and going through the same things with their kids! MOPS is so great. I love the time to visit with other moms, make new friends and it's good for Judah too. He gets to spend time in the nursery with nice people that love him and hang out with other kids! Kelly- I found your blog several months ago & LOVE reading it. I have a baby girl a few months older than Harper & she has that same cute dress!!! (I also just bought some similar boots for her at Target). So cute!!! we have alot of hard floors too and invested in throw rugs and Baby Leggs for Chloe..
Brian & I do alot of "dates" on the couch catchin' up on our shows and eatin a grown up dinner! Love those night! I love MOPS...I started going in January and I wish I had gone earlier. I didn't know what I missing. I just became a Care Group Leader and it's so much fun. I love being with other mom's and not feeling alone. This is my first year NOT to be in MOPS in six years! I was actually coordinator last year. I love MOPS! Harper is so darling! I cannot take it. Her little smiling face makes me smile instantly. Tooooo cute! So my biggest dream is to one day own a baby boutique. I want to open one online sometime within the next year. My biggest nerdy confession is that I hope it's done while Harper is still a baby so I can send you some cute stuff for her!! Love the outfit on Harper!! Where did you find it? Harper's outfit is precious! I just love the bright colors! So fun! I LOVE those boots too! Those are so adorable! I volunteered as a MOPpets leader last year and loved hanging out with the sweet little preschoolers. She is just the cutest little thing! Don't you love it? I would have loved to go to MOPS with all three of my kids, but you can't if you are a working mom, at least where I live. All the meetings are during the workday/in the mornings. Yay for dates! And I adore those little Ugg boots! I am in MOPS and I love it. I joined MOPS in September 2007 and it has been a god send. Love;love;love that adorable dress and head band. I am so happy to hear that she is feeling better. As far as MOPS, I love my MOPS group. It is such a fantastic organization and the kids as I love going. My oldest is sad the he is missing out this year due to being in Kinder. Hi Kelly! I am so glad Harper is feeling better! Those ear infections can be so nasty for little ones! I hate it when you know they are in pain, you as a mom can feel so helpless! I am also glad you made it to MOPS! I love our MOPS group! It is so good to be able to hear words of encouragement from good Christian Ladies who are in or have been in the same boat as us moms! How often does your group meet? Ours is just once a month, but we are thinking about making it more often! Hope you guys are getting some of this cooler weather we are here in MS! I'm with Rory. Spill the info about the dress ;-) SO SO CUTE!!! So is the little lady in it!!! Love the boots! My little man has some just like them that are dark brown, but his feet are still too small! Those boots are so cute and they look like they would be really comfy! I want some! I also love that plate! Enjoy your weekend catching up on DVR, we have the same thing going on around here! Those boots are TOO cute! I'm really considering getting a pair to wear around the house and keep my toes warm. we had cute little boots just like that!!! they were my very favorite! Hope you enjoyed your Mommy/Daddy time!!! Love the adorable dress she is wearing, I have been following your blog for a while after I found it through Design Girl, and look every day for your new posts. You always seem to have the cutiest outfit on Harper, you must have so much fun shopping for her. Thanks for sharing so much on your blog. Love your barstools, where did you get them? Glad to hear you're in MOPS! It's such a great organization! I served as our Hospitality Chair last year and had a blast doing so. We were lucky to have a tremendous steering team and we all had such a great time going to the annual MOPS convention in Dallas. It's such a wonderful way to share the love of Christ to other moms! The groovy outfit is adorable and of course Miss Harper is too! just joined MOPS... LOVE it!! I used to be a MOP and am speaking to a MOPS group tomorrow morning. I wanted to tell you that this weekend I was speaking at a church womens retreat in San Antonio. During one of the sessions I mentioned I was from Little Rock. A very young, very cute mom came up afterwards and said she was from Magnolia and we started talking and wound up realizing we both "knew" you. :) Anyway ... I asked the ladies to share examples of God writing the story of their lives and she spoke about how she had a baby and then went through 5 miscarriages before getting pregnant (due in Dec.!). It was the sweetest story of God's work in their lives and afterwards I told her ... "now I know how you know Kelly" ... and although I'm sure you know, I wanted to remind you that you do have such a neat ministry to moms struggling with infertility ... you "get it". I loved her comment when she said ..."Kelly just seems like everyones best friend." Hi, do you know what brand your cabinets are and what color they are? I love them and I am remodeling my kitchen. Thanks.